I just sorted through bank records from the time I was away, and thought I'd share what I learned about the expenses of the last two weeks on the road. I'm not reporting on food, restaurant, or other incidental costs. These are about the same as they would be if I were home. The two major "on the road" expenses are gas and campground fees. I spent about $400 on gas, and about $130 on camping fees. Total: $530, or for the two weeks I was away, about $38 per day. I was stationary in White Rock with no "camping" fee and very little gas cost while I was there, so the expenses for when I was actually on-the-road were closer to $75 per day. A reasonable comparison (other than to staying home) might be to car/motel travel. The Beast was getting about 9 miles per gallon, and the Hyundai would have gotten about 30 mpg: so say that my gas cost in the Hyundai would have been about 1/3 of that $400, or $133. Motel costs would be harder to estimate, but even Motel 6 rates for 1 person would be about $50-60 per day. I'd have spent more money on food, since I'd almost certainly have been eating out pretty much all the time, but I'll leave that out of the comparison for now. So in the car, my daily cost would be about $20 for gas and $55 for motel, or $75 per day. The same per diem cost as camping in the RV. Simple comparisons break down pretty quick. Staying in Motel 6's for a week would NOT be my idea of a good time; it might be a way to get from Point A to Point B, and if that were my sole purpose I could clearly get there faster at 75 mph on the interstate in the car rather than 60 mph in the RV. Driving in the RV is, for some reason, less fatiguing than in the car. I enjoy camping, even at an RV resort, MUCH more than staying locked up in a motel room. 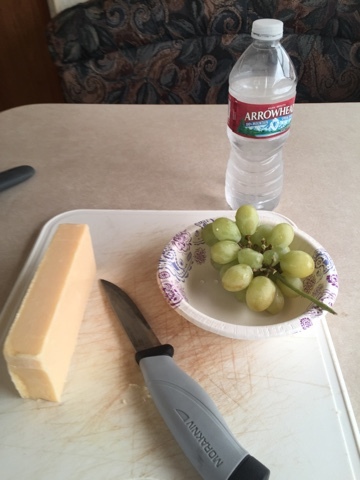 The intangibles make a difference, and they all come out in favor or RV travel, especially when I add back in the fact that I'd be eating "in" a lot more, and probably eating better. Summary -- while $75 isn't cheap, it's something that I can afford to do. It's a good planning number for future trips done in this style. The trip from White Rock to Tucson didn't go as planned, but worked out fine. I got up real early, put the sheets and towels in the wash, and while that went on I loaded my stuff into the Beast. Vacuumed and damp mopped the places I'd been in the house. Ate a quick breakfast. By 8AM the wash was done and I was ready to hit the road. Filled up the Beast with gas and went on down past Santa Fe and through Albuquerque. I'd planned on stopping somewhere overnight, depending on when I left... had a series of possible places to stay: a couple of Walmarts, and some truck stops. I travelled slow, and as I passed the places I'd though I might stay, it became clear that I might make it home to Tucson if I just kept on keeping on. I did. It was probably my longest day of driving in the Beast ever. But I never felt tired or sleepy, for some reason. The hardest part of the trip was driving through Tucson in the rainy dark. The weather here is exactly what I don't like about summer in these parts: it has rained a lot here, and it's hot and kinda muggy. I had thought to turn on the a/c in the house as I travelled: my thermostat has an internet connection for just that reason. So it was nice and cool inside when I got there. Took the minimum into the house last night: toilet kit, slippers, and coffee. I have my priorities! This morning I'll finish unloading the contents of the Beast into the house, and probably take it down to its home in the storage lot. Then I'll settle into my Tucson routine, and get ready for my next trip: I'm going to Vegas for a weekend with a friend. Next RV expedition? Dunno. It'll be quiet here for a while. I'm taking a nap break near Socorro, NM, south of Albuquerque. I left White Rock around 8 AM; I'm not sure where I'll be tonight, but I'm pretty sure I'll be home in Tucson tomorrow. Still in White Rock, where it's 56 degrees and mostly sunny at 9 AM. Just thought I'd throw that in here for my southern Arizona friends. Weather aside, I'm thinking about thinking about heading for home... perhaps arriving mid-week next week. Last post I outlined some of the mechanical/logistical issues which have marked this trip. This time, I want to focus on what might be called the inner game: my motivations for doing this, and things I'm learning about myself as I go on down this road. I've said before: the original idea was to get out of Tucson heat in the summer. An RV seemed like the most affordable way to do that. I'd lived in Flagstaff, and summers there are close to perfect. But buying a second home up there, or renting one, were out of the question financially. The Beast does make it possible to get into more tolerable temperatures. And to visit, and re-visit, places I've seen before and liked, or always wanted to see. Dealing with the inevitable mechanical issues has been stressful; as I said last time, I've never been a hardware guy. But one of the ways one manages aging is to try new things, and while it's sometimes not all that enjoyable, stretching my limits has surely been one outcome of this venture. This old dog needs to keep learning new tricks. Learning new things has always been a pleasure. I enjoy figuring things out. I hadn't thought about just how much of that would be required to prepare for travel with the Beast. The personal issue which has surfaced this trip more strongly than before is the matter of being alone. A good friend put it this way: I'm loneliest when I'm happy. I don't need someone to be with me in the emotional bad times. I'm loneliest when there is something beautiful that I want to share, and no one is around to share it with. And that has been my experience this trip. I haven't wanted/needed someone with me to help when problems arose, or even, particularly, to hold my hand when I felt bad. But often there are moments when I want to say, "Hey, look at that!" Or to have my attention called to something I'd have otherwise missed. This is true occasionally when I'm not traveling: I live alone. But it happens many times a day when I travel: either there's something beautiful, or someone interesting. And there is also the phenomenon of companionable silence: simply being with someone without the need for comment. I've missed having someone with me. A lot. This feeling is not new for me. But this trip it's been stronger than before. It seems like most people I see in RV's of various stripes are either couples or families. I'm wondering how other single travelers deal with this issue, if it even is an issue. I'm in White Rock, New Mexico, staying at the house my generous friends here make available while they're off in Maine for the summer. As I write, it's about 72 degrees and sunny here, headed for the mid-80s. Home in Tucson it's about 95 now, headed for 105. Need I say more? It hasn't been the trip I expected, and I'm thinking it never is. I've been on the road about a week, and let's just say there have been challenges on several fronts. Over on the right, the "About This Blog" box says that sometimes the posts here will be about the meaning of it all. This may be one of those. The sulfurous smell from the hot water heater, which was mostly cured by draining and refilling the tank. Turns out this is a common problem. The manufacturer advises a vinegar rinse, but so far a simple drain and fill seems to have done the trick. The suspension air bags weren't holding air. This problem was solved by tightening the hold-down nuts for the valve stems, and by finding an old-fashioned air hose to air them up. They've held air since I did that just south of Moab last Thursday. On the drive up here from Santa Fe, the "check engine" warning flipped on. I got out my OBD reader, looked at the problem codes, and talked to my mechanic back home. He suggested that the problem (misfires on a cylinders 1 and 9 ) may well have been transient, possibly altitude-related, and certainly didn't require immediate attention. I reset the codes and we'll see if they recur. The warning light is out, for now! I'll take it in to Buck's when I get back. So all mechanical issues are back-burner for now. But what all this reminded me is how much a software guy I've always been. Words, numbers, images: I'm cool. But hardware has never been my forte. It's in the nature of this kind of travel that there will be mechanical issues. And so part of The Meaning Of It All is that I've been learning to deal with the Beast as machine. I've been alarmed and clueless, but not for long. And every time something goes wrong, or seems to, and I figure it out and deal with it, my confidence level goes up and my panic threshold recedes. There were times this trip when I was ready to throw in the towel on the whole RV thing. Perhaps to my credit, I stopped myself from dwelling on this impulse, and promised myself that I'd think about that when nothing seemed to be hitting the fan. This calm time in White Rock provides that. Right now, I'm much less inclined to sell the Beast and stay home and sulk. There have been some great moments on this trip. The night in Canyonlands at Hatch Point Campground was one. Discovering that I actually enjoy a night at a well-run commercial RV park, and don't have to be the Big Bad Boondocker all the time. And those moments of simple pleasure tooling down a highway on my way from somewhere to somewhere else. Part II has to do with taking stock of non-mechanical issues. I won't go through the whole laundry list, but the problems from the last few days have more or less solved themselves. I have hot water that doesn't smell bad, and the air bag suspension components are staying inflated. From here in Gallup I'm headed for the ABQ/Santa Fe/White Rock area. It's amazingly hot in southern Arizona, so I'm in no hurry to get back there! And the schedule for my September trip to Vegas is down: hotel, a couple of shows. Haven't been to Vegas in forever. I'll explain later but things aren't so sure. This'll be brief -- I'm in Gallup, and rather than proceed north as planned, I'm headed back along the same route to Tucson. The short story: mechanical problems with the rig suspension, which involve work which was done by my Tucson mechanic. I should have no problem getting home as long as I treat the rig gently. This is disappointing, to say the least. I took dozens. These mostly tell the story. About that road -- I guess it might qualify as "highly improved." Teeth-rattling washboard for 10 miles each way. My tree. It's not a bristlecone, but it has that gnarly look. The campsites are up on the rocky bench in the foreground. There's a big wide open space, which is uncharacteristically green because of all the rain. Then the land drops off. Those cliffs in the distance are on the other side of the Colorado River. Thanks to Steve for expediting this. The USPS got it to Moab by 9:30 this morning. This has to be close to quintessential boondocking. As in, “out in the boondocks.” The nearest human is probably about 20 miles from here. Dark… I got up in the night and went out and looked at the sky, walking carefully by starlight. Silent … I heard a jackrabbit lope down the path; I heard a hawk fly by to check out my camp. And a brief coyote chorus, just before first light. Morning chores. I washed the few dishes from breakfast, and took the warm soapy water out to the picnic table and had a sponge bath, naked in the morning. I emptied the wash water into a bucket, used some warm water to rinse myself off, and emptied that clear water into the bucket. Swept the rig, and mopped the floor with the warm water. Reorganized and cleaned one of the kitchen cabinets, and one of the storage compartments under the rig. Deployed the solar panel, which amounted to pointing it East rather than West. The sun has just hit it … even at the very low angle of dawn, it’s putting out 3.3 amps, enough to begin topping off the batteries from last night. The cell service I was so happy about yesterday turns out to be not so great. Sometimes the hot spot shows one bar of 4GLTE, sometimes 3G, and yesterday for a while it showed “1,” which is Verizon’s way of saying “no service.” This post will probably be uploaded from somewhere in Moab. Today’s agenda is to visit the Post Office and pick up the packet with my Federal pass, and figure out where to spend the night. If it’s as late as it might be, I’ll probably head up north of Moab to that boondock spot I used last trip. If I have some travel time, I might get on with my northering: up to I-70, East to the charmingly-named little Colorado town of Fruita, and thence north to Wyoming. Up until now, I’ve been in more or less familiar territory, although this campsite is new to me. Once I head north from Fruita I’m breaking new ground. Somewhere soon-ish I need to empty the holding tanks and add some fresh water. I got into Cortez a little shy of 10am, way too early to stop for the day. At my rate of travel, I’d get in Moab about noon! Then I remembered a really nifty BLM campground south of Moab — Windwhistle. Then I remembered that there was what was supposed to be an even nifter campground further down that road. So here I am Hatch Campground. Alone. No camp host, no fellow campers. This will be the most remote campsite I’ve ever had in the RV. Lovely! It’s cloudy-bright, but the solar panel is pumping out juice like crazy, so I’ll hit darkness with everything fully charged. Me and the ground squirrels and some gnats and a LOT of red ants. And some weak but workable Verizon 4GLTE cell. Is this cool, or what? I’ll take more pictures this afternoon. Remote? You betcha! But with what looks like useable Verizon. So that's problem one more or less taken care of. My Golden Age card is on its way to General Delivery in Moab, to arrive tomorrow (Thursday) afternoon. My plan is to amble up to the vicinity of Cortez, CO, today, and then to Moab the next day. Short, easy days. I've been having some thoughts about commercial RV "parks." I'm staying at one now: USA RV Park in Gallup, which I found through the Escapees directory. And I'm impressed. The convenience of electricity, water, and sewer service cannot be denied. The place is really really clean. It's ugly as sin ... but it is, after all, a big parking lot near a town. The sites are all "pull thru" so if you're hauling a trailer it's easy in and out. It's quiet, and has amenities like a pool and playground if you're so inclined. They serve a BBQ dinner every night ($11 max.) I passed. They have a small store (I bought ice and paper towels.) The staff are pleasant. I sat on my "porch" last night for a while before the rain drove me in, and exchanged pleasantries with people walking their dogs. It was very suburban. It felt very middle class white folks. The reason I stayed here was that I needed water and sewer connections to diagnose the smelly water problem. But I realized that I've gotten myself in a mindset in which anything other than boondocking with solar power is "less." I've set myself up to do that. Staying at NFS or BLM campsites is OK, but less virtuous than dry camping. Well, no! I'm happy to use places like this from time to time, and while I have to struggle to convince myself I can afford it, I can. So I may stay at another place like this tonight up near Cortez. It serves mostly people headed for Mesa Verde. If the roads are passable after all this rain, after I pick up my mail at the Moab PO, I'll head for the same boondocking site north of Moab I used for many days on my previous trek through these parts. Maybe. Plans change. Stay tuned. My good friend Stephen located the Golden Age Pass on my dresser at home and it will arrive in Moab, UT, on Thursday, USPS willing. Don't snicker, they're actually pretty good at this. Doesn't that look like fun? Yup, the water coming out of the HW heater is smelly. I have bypassed it so that cold water comes out of both sides of the system, so I can't accidentally unleash the smell. For now, I'll consider that a workaround. I can live with heating water on the stove for this trip if I have to. I'll pose the issue to the gurus on rv.net and see if anything gets suggested. I now know enough to pose a half-way intelligent question. I think. I’ve been here before: once on a weekend trip from Tucson with friends, once as a “first night out” location headed north. That’s why I’m here now: I want to get north as efficiently as I can. The location is good for that: it’s a relatively easy day’s drive from home; it’s a pleasant spot with pine trees and shade and level places to park. Basic stuff: no utilities. Pit toilets, well-maintained. When I pulled in, I discovered that, of all things, I’d left my “Golden Age” federal pass at home. It gets me a 50% discount on camping and free access to parks and monuments etc. I have the pass number written down, so I put that on the registration slip along with my check and dropped it in the box. Shortly afterward things went mildly sideways. The campground host (employed by the private company to whom the Forest Service has outsourced the management of campground hereabouts) showed up in his electric cart and asked to see the card. I explained I’d left it behind, but the number was on the slip. Sorry, the rules are clear: the card must be shown. No, he didn’t doubt me, but rules are rules. And to back him up he called in the boss, his wife, who said the same thing with all the pleasant demeanor I associate with underpaid high school librarians having a bad day. I wrote another check to make of the difference in fee (all of $8; this isn’t about the money) and went to sit down in the rig to nurse my righteous sense of having been screwed over by The Man. Things got even more interesting. I ran some water to wash the few lunch dishes I’d generated when I stopped in Payson for gas. Hmmm. Smells funny. Yup, really funny. I checked the water at various places: kitchen sink, bathroom sink, toilet. Distinct, unpleasant, sulphurous smell. I’d topped off the tank at home. But the water sitting in the tank must have gotten contaminated somehow… I realized I’d checked the rig’s water system while it was connected to my house, and hadn’t actually run water out of the storage tank. Lesson learned. I carry a lot of drinking water with me in various containers, and use the rig’s fresh water tank only for washing and flushing. But this smell does not seem like something I want to wash in. So. The plan now is to continue north to Gallup, and rather than park overnight for free in the casino parking lot, to stay at a commercial camp with full hookups. I’ll drain the water system, refill it with a very dilute Clorox mix, let it stand, drain it again, refill … a good afternoon’s project. 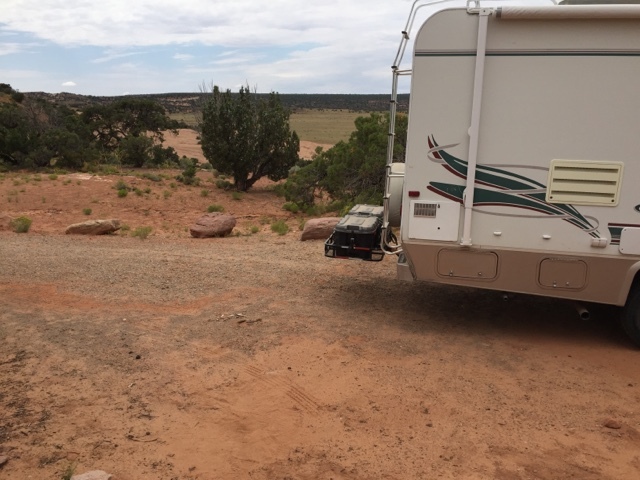 Pain in the neck, but there seems to be a good, not too expensive RV camp in Gallup. Part of the Escapees network, which I joined mostly to get their directory of boondocking sites. I checked: I DO have my Escapees card with me. Breakfast time. It rained in the night, and the air is full of the pleasant smells of a pine forest after rain. The last couple of days have been spent organizing gear, clothing, and food and packing the Beast. It's been complicated by a resurgence of a familiar back pain which chose this moment to come on strong, and by the turgid heat of Tucson summer, which I'll be free of by this afternoon. The last major chore is food shopping, which includes wine, tonic, and other libations. The RV fridge has taken a while to get down to temp, which happens every time, concerns me every time, and sorts itself out every time. I'll probably put up a short post from my phone when I actually leave. If memory serves, there's usable cell service at the FS campsite near Payson which is my destination for the night. As a fellow blogger would say, "Cya down the road..."
I looked at the earlier route, and this is shorter with less mountain climbing. It gets me directly to the Flaming Gorge area, and that 400 miles I save translates into about $125. Yay! Overnight stops beyond the casino are still undecided. Old starter battery was barely in the "good" range when tested. Don't want to have starter issues when boondocking. Or anywhere else, for that matter. This is why I take it in to Buck before long trips. "Mega-tron!" Gotta love it! I'm headed out. North, up towards Wyoming. The last time I said that, I never wound up getting there. No matter. It's hot here and I'm tired of it. The Beast has an oil change and checkup at Buck's tomorrow. Emma will be well-cared-for by my good friend across the road. It takes me along some familiar territory. I liked Rte 285 through the CO backcountry earlier in the summer, and will be glad to see it again. I might jog over to Albuquerque if a friend of mine will be there that week. If I have a destination, maybe it's the Flaming Gorge area up on the Wyoming/Utah border. I might push further north into Wyoming once I get there. Even though the setting is different, I'm humming "On the Road Again" as I make lists. I haven't planned how to get home again; my idea is to be back in Tucson by September 1. Roughly. Sometimes I call myself a "recovering academic." Exploring the world of ideas and places. Living in the desert of southern Arizona, traveling in the Southwest in my RV when the spirit moves me. This is about my travels in a 1999 24-foot class C motorhome, which I sometimes call "the Beast." It's also about projects, renovations, repairs, and plans which occur to me when I'm on the road. There's a lot of these RV travel blogs out there. I've listed below some of the ones I read regularly. My intention is not so much to publish a travel magazine, but to record where I went and what I did and what I did to the rig and what I'd like to do. Something close to the original meaning of "log." Random thoughts on the general enterprise of RV travel will creep in. The Big Diamond Fiasco: A Girls Dream Comes True? copyright (c) 2015 Richard L. Muller. Simple theme. Theme images by gaffera. Powered by Blogger.